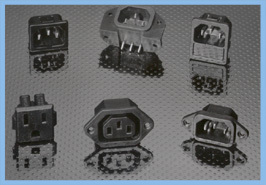 High Tech Connections offers a wide selection of versatile IEC/EN 60320 compliant power inlets and reverse accessory outlets. Molded of type 6/6 Nylon with a flammability classification of 94V-0, these components allow for product standardization throughout the world. A wide variety of popular units are featured including those that can be mounted to the panel either by screw or rivet method, snapped-in and those that mount directly to a printed circuit board. Engineers can select from fused and non-fused styles and from units with rear connection tabs of either .187" or .250" male quick disconnect taps or solder terminals. Multi-ganged devices and modules with voltage selection features and on-off switch options can be produced on a special-order basis.